The ease with which our legislators strip away fundamental rights is genuinely frightening. 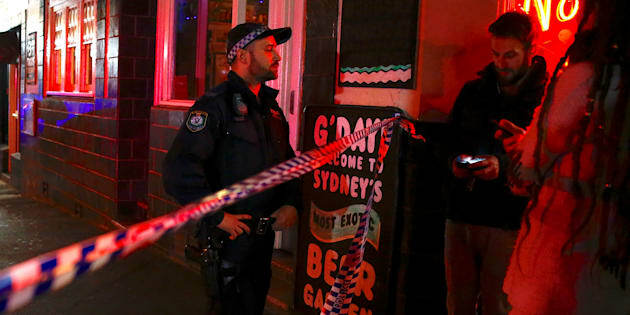 July 29, 2017: A policeman refuses to let members of the public walk onto a Sydney street that has been blocked to the public after a counter-terrorism raid. When it comes to terrorists, who needs civil liberties? They're out to get us and we need every power we can get to protect ourselves. It's them versus us, and we're going to win. Right? These are the some of the questions that the Parliamentary Joint Committee on Intelligence and Security is currently grappling with as it undertakes a review of counter-terrorism laws. Specifically, it is considering whether we should retain laws that many see as dangerously broad and offending the rule of law, in case they might assist us in the fight against terrorism. The laws in question, which allow the use of control orders, preventative detention without charge or trial and warrantless searches of private property, were all introduced in 2005 following the horrific terrorist bombings in London that left more than 50 people dead and many hundreds injured. Law-makers agreed that we could not allow such a thing to happen in Australia. Since the laws were introduced, control orders have been used six times. Preventative detention has never been used federally, and just a handful of times at the state level. No warrantless search has ever been conducted. As he introduced the reforms, the then-Attorney General Philip Ruddock explained that the powers would ensure that "the toughest laws possible to prosecute those responsible should a terrorist attack occur" were available. He added that "we are in the strongest position possible to prevent new and emerging threats, to stop terrorists carrying out their intended acts". Laudable ambitions, no doubt. However, the proposed means of implementing these aims was not without controversy. The inquiry at the time received nearly 300 submissions, many of which expressed concern about the way that these laws would undermine fundamental rights that had existed for centuries. These concerns have continued to be expressed in the intervening years, with many arguing that the powers go too far in undermining civil liberties without any proof that they indeed make us safer. Which is, after all, the name of the game. The Council of Australian Governments, for example, recommended for the repeal of preventative detention orders, that significant additional safeguards be implemented around control orders, and for greater judicial oversight of search powers in 2013. The former Independent National Security Legislation Monitor, Bret Walker SC, recommended repealing control orders and preventative detention orders, replacing the former with continuing detention orders available only for people who had already been convicted of terrorist offences. He noted that there "is no demonstrated necessity for these extraordinary powers", and that established powers of investigation, arrest and detention were adequate to protect national security. The UN Human Rights Committee has expressed concern at the lack of response to these recommendations by COAG and the INSLM, recommending that all limitations on human rights for national security purposes be strictly necessary and proportionate, and subject to appropriate safeguards. These are well-respected experts in the field of counter-terrorism, and they are concerned that these extraordinary powers do not increase our safety from terrorist attacks in any way. Alarmingly, some legislators in this country think that what they call 'civil liberties' are a luxury that can be easily dispensed with when it suits. The Victorian Premier Daniel Andrews, for example, recently suggested that people in his position did not have the luxury of considering civil liberties. Mr Andrews and his fellow leaders at COAG thought there was nothing untoward about legislation to expand preventative detention to children as young as 10. The ease with which our legislators strip away fundamental rights and protections, even for primary school children suspected of no wrongdoing, is genuinely frightening. International experts make it clear that civil liberties, human rights and counter-terrorism laws in fact can exist in perfect harmony. The UN itself has said, in its global counter-terrorism strategy, that protecting human rights is an intrinsic part both of protecting ourselves against terrorism and eliminating the conditions conducive to the spread of terrorism. The first UN expert on counter-terrorism and human rights, Professor Martin Scheinin, made it clear that balancing human rights and security is not necessary. "The proper balance can and must be found within human rights law itself. Law is the balance, not a weight to be measured." Counter-terrorism laws, after all, seek to protect the most precious human right of all: the right to life. When people defend civil liberties and human rights, it is not because they do not defend the right to life. It is, rather, because all rights are best protected in harmony. Protecting human rights, such as the right to privacy, freedom of speech and freedom from arbitrary detention, in fact enhances our ability to defend ourselves against terrorism. The international instruments that have recently codified these ancient rights make it clear that these rights can be limited, to the extent that it is 'necessary'and 'proportionate' to any threat to national security. However, when existing police powers are adequate to investigate, detain and punish terrorists, it is hard to argue that the laws that do away with fundamental rights, and have defined our civilisations for centuries, meet this threshold. Their lack of use, after our security forces have foiled numerous threats, indicates that there is no need to sacrifice rights for security. This is not just theory. Doing away with fundamental rights in the name of security is dangerous. In the 1970s, the UK interned hundreds of suspected IRA supporters in an effort to quell the civil war in Northern Ireland. However, in the following months, conflict increased dramatically. Ultimately, it was admitted that this preventative detention generated greater support for the IRA. Rather than keeping the population safe from violence as promised, the policy stoked community divisions. In that case, when it came to terrorists, doing away with civil liberties caused greater bloodshed. We ignore that lesson at our peril. The Parliamentary Committee is continuing to accept late submissions as a part of its review of these laws.